GlacialTech's Igloo 2310 and Igloo 2400 were scrutinized last spring and revealed an attractive combination of technical parameters. They took the lead and pressed out rougher competitors. The new GlacialTech's products for Socket A took the baton and proved that using the right approach it's not difficult to move mountains. Igloo 2320 and Igloo 2320 Pro are actually a modernization of the good old Igloo 2310. They inherit all worthy thermal effectiveness catalysts - the trapezoid-shape fin, alternating fin height and the off-centered fan position; at the same time they incorporate an improved heatsink, 70x70x35 mm (70x63 mm base) with enhanced fin parameters (0.7 mm think at the base, 0.2 mm at the top). 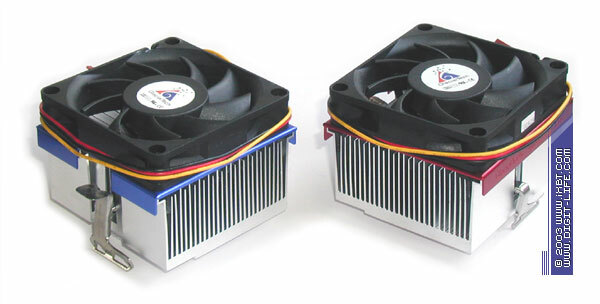 The fans are the same - 60x60x25 mm (3000 rpm and 4800 rpm); they have really good build quality. Their thermal effectiveness is much better as compared to Igloo 2310. Igloo 2320 works a bit quieter than Igloo 2310 and gets into Top Ten in the effectiveness/noise table. Igloo 2320 Pro is noisier, however the noise level is not that high. 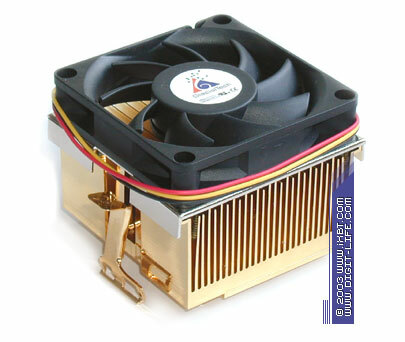 Installation is not troublesome: the light heatsink of comfortable dimensions and a handy reliable mount comply with the AMD's requirements. It makes the coolers compatible with almost all existent Socket A mainboards. All this raises the overall functionality of Igloo 2320 and Igloo 2320 Pro and let them take good positions in the finals. 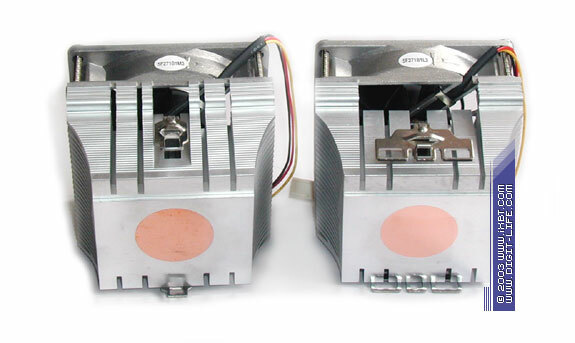 Igloo 2410 and Igloo 2410 Pro are formally successors of Igloo 2400, but they actually extend the Igloo 2320 line having a heatsink identical in dimensions and parameters. 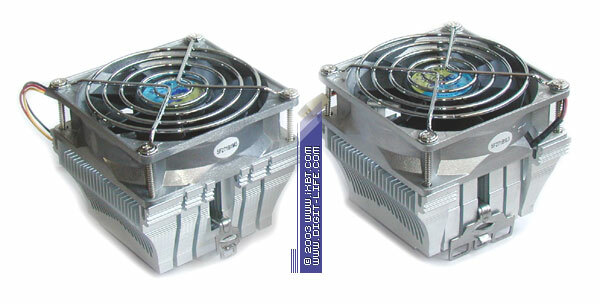 They inherit from Igloo 2400 a fan of the same size - 70x70x15 mm but of higher quality - Bi-Sonic Technology BS701512L (2800 rpm) and BS701512HH (5000 rpm). 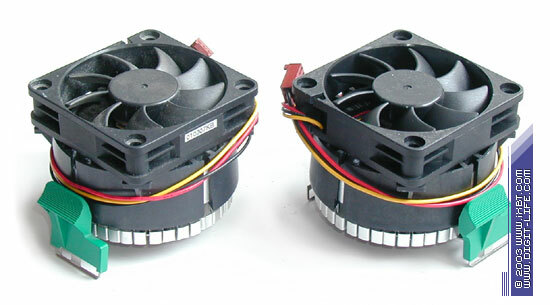 The new fans have an impeller with optimized aerodynamic and noise characteristics. 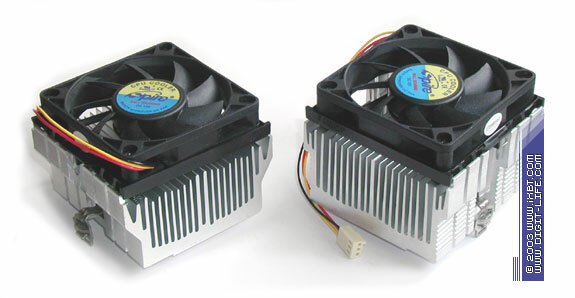 Thus, the developers of Igloo 2410 could leave the heatsink's size comfortable (like that of Igloo 2320), making the coolers them as effective as Igloo 2400, and cut down the noise level without moving the fan off center! 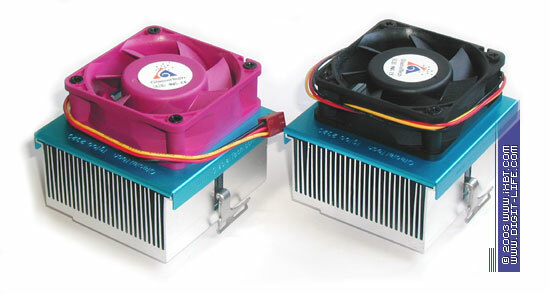 Igloo 2410 Pro is even ahead of Igloo 2400 due to the compact heatsink and a lower noise level. As a result, Igloo 2410 takes a good position in the technical chart Top Ten. Igloo 2410 Pro makes a good showing as well. Now have a look at the four latest Socket A models which are right around the corner. Igloo 2500 and Igloo 2500 Pro inherit the philosophy of the Igloo 2410 and Igloo 2410 Pro. 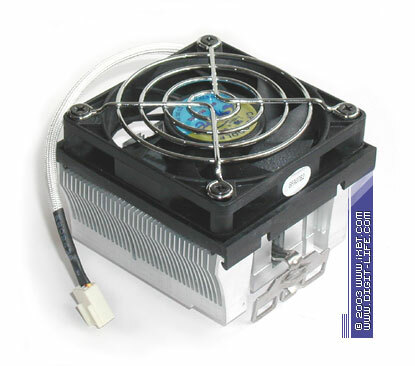 The new coolers are of the same size, come with an extrusion heatsink with the enhanced finning, the same pleasant 4-point mount and good Bi-Sonic Technology's fans. What differs them is a copper plate, 70x50x2 mm, mounted on the heatsink's base. 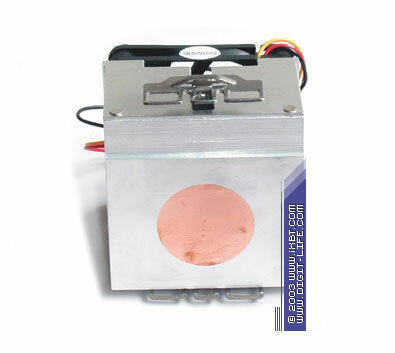 This plate is attached to the heatsink through special technological process (a kind of welding) providing high-quality and clean copper-aluminum interconnection with very low contact thermal resistance (in the thermal terms such structure can be considered as a single whole). Consequently, Igloo 2500 and Igloo 2500 Pro score brilliant results! Igloo 2500 Pro topples the last-year record-breaker copper Thermaltake Volcano 7+ being quieter by 10 dBA. Although Igloo 2500 can't beat Volcano 7+, it keeps very close to it having the noise gap over 20 dBA! As a result, Igloo 2500 and Igloo 2500 Pro show the excellently balanced technical characteristics and take prizes in almost all today's ratings. Another new-comer from GlacialTech is Igloo Silent Breeze 462 - the luxurious product with a very attractive exterior: its heatsink and mount are gold plated (24 carats). 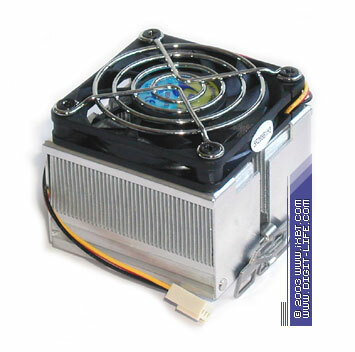 Igloo Silent Breeze sports a hi-tech heatsink of Igloo 2500 which proved its might already. The fan mad by Bi-Sonic Technology rotates at 2100 rpm and makes very little noise. Igloo Silent Breeze has reached incredible thermal effectiveness and a record noise level (27 dBA)! At the moment, it has the best effectiveness/noise ratio and best functionality, and takes the leading position in the final technical rating. 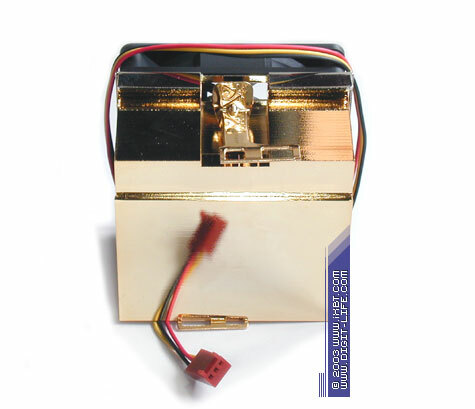 Diamond 2000 is also dressed in gold but behaves more modest because it is equipped with a standard heatsink from Igloo 2320/2410 (without a copper plate). Nevertheless, it's not deprived of its own advantages. 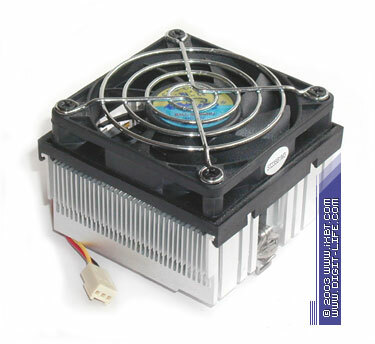 Instead of an ordinary fan it has one with correct temperature control support which regulates impeller's speed from 2500 rpm to 5000 rpm depending on the temperature inside the PC case. Thus, Diamond 2000 is actually a combination of two coolers: at 33 degrees it works as Igloo 2410 (with a lower noise level), and at 45 degrees it turns into Igloo 2410 Pro. This quality adds extra scores to Diamond 2000 helping it to outscore Igloo 2410 in the technical and economical ratings. 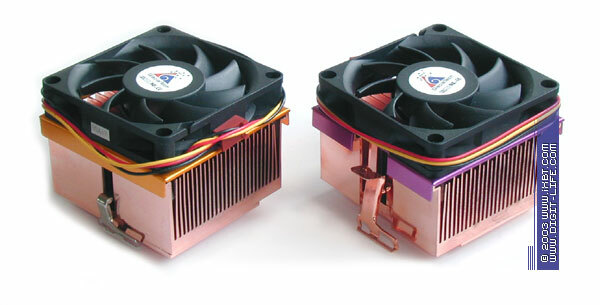 In our recent tests of the Molex Socket A coolers we found out that they had decent quality and good specs. The 37165 series is out-dated but it's not the right time to charge it off. As elders these coolers perform well, but they surely not a match for modern pace-makers. The models from the 37256 series, the future debutants, proved to be interesting and promising solutions. 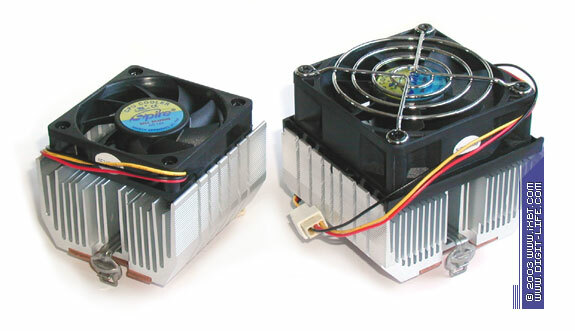 With advanced combined heatsinks and high-quality fans, these coolers show good thermal effectiveness and an acceptable noise level. Today the 37256 series sports rather good functions and often outpaces rougher contestants. The model 37256-0001 managed to get into Top Ten in the technical rating leaving behind a lot of its counterparts. The coolers of the Spire trade mark produced by Fanner Tech were tested last year when we studied cooling systems for Socket 478. Their performance and build quality are pretty good. BigRock and SuperRock which open the Spire's Socket A line look quite massive for "old-fashioned" entry-level models. Impressive heatsinks (74x78x38 mm with the base of 74x63 mm of BigRock, 74x78x45 mm with the base of 74x70 mm of SuperRock) with good finning, fans, 70x70x15 mm, running at moderate speeds (4000 rpm), and a 2-point standard and handy mount look quite promising. Kids BigRock and SuperRock are effective enough and catch up with much older counterparts. The noise level is quite far from unacceptable. The only downside is a too wide base of the SuperRock's heatsink which makes difficult to install it and can be a real problem in certain cases. As to functionality, BigRock and SuperRock outdo many budget solutions but they can't near the leaders of the technical rating. WhisperRock III which belongs to the Spire's basic category looks more impressive: a powerful heatsink, 80x82x40 mm (base 60x60 mm) with decent fin parameters and an attractive fan, 80x80x25 mm, rotating at the speed of 2500 rpm in a solid aluminum case make an impression of a good, durable solution. WhisperRock III has certainly better thermal effectiveness than its brothers. Its noise level is beneath 40 dBA - which is also an advantage over its siblings and puts it into the low-noise category. In spite of large dimensions, the heatsink of the WhisperRock III is handy in installation: it's light (a tad over 300 g), has a comfortable base and a big cut angle of the side fins, that is why even uneasy boards will hardly make any compatibility problems. All in all, WhisperRock III has well balanced specs (the fan is of very high quality) and gets into Top Ten of the economical rating. 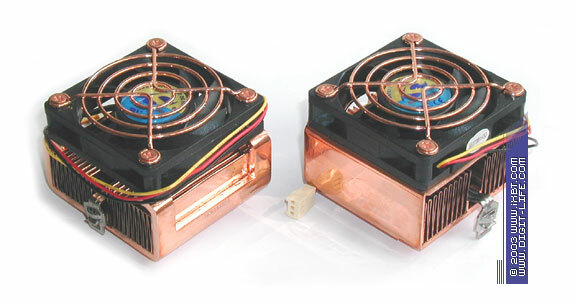 FalconRock and FalconRock II follow the WhisperRock III in every aspect: they have a big but handy heatsink and a high-quality fan, 80x80x25 mm, embedded in an aluminum case. A new feature of FalconRock and FalconRock II is a copper disc pressed into the heatsink base. 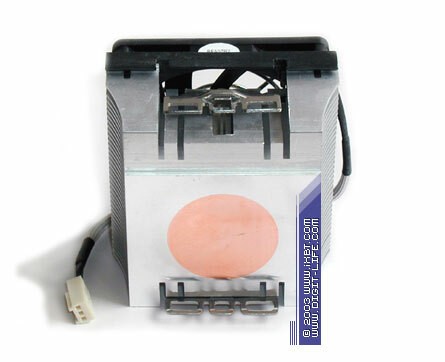 Fanner Tech says that molding is carried out according to strict technological norms (as a result, the contact thermal resistance is minimized where the disc is connected to the base); consequently, it must improve thermal parameters of these coolers. FalconRock is a bit more effective than WhisperRock III but their noise levels coincide. FalconRock II is as efficient as WhisperRock III, but makes less noise (33 dBA). FalconRock II also has a handy 6-point mount. As a result, FalconRock II takes a place in the technical chart Top Ten, with FalconRock being quite close. One more Spire cooler of the basic category is SkiveStream; this is a more moderate solution than WhisperRock and FalconRock. Nevertheless, its design is charming as well: a compact heatsink, 60x60x36 mm with advanced finning (skived fin technology), a copper disc pressed into the base, a fan of 60x60x10 mm and a mod 6-point mount. SkiveStream performs pretty well (thanks to the enhanced finning and the combined copper-aluminum heatsink), but its noise degree is not that good because of the high-speed fan (in spite of its small size) - 5000 rpm, and dense finning. In spite of the decent performance, SkiveStream is not able to go on a par with WhisperRock/FalconRock. MicroFlow is positioned as a budget solution, but it actually is more noteworthy. A heatsink of 73x69x30 mm (base 67x69 mm) with good finning (the fins are only 0.5 mm thick) and a moderate fan, 70x70x15 mm, working at 3800 rpm make an impression of a good balanced product. Thanks to the advanced finning the MicroFlow works very effectively - its performance can be compared to WhisperRock III and FalconRock II. Its noise level is not that bad either (43 dBA). But its rather bulky base, nonoptimal effectiveness/noise ratio and a quite poor accessory pack prevent it from catching up with the leaders of this round. The latest Spire's top model - MicroFlow II is an updated version of MicroFlow. A heatsink of 73x69x34 mm with even more advanced finning (0.4 mm fins), a handy base of 60x69 mm, a pressed-in copper disc, the same quiet fan and a good 6-point mount place MicroFlow II much higher than MicroFlow. The thermal effectiveness of MicroFlow II is pretty nice - this cooler loses only to GlacialTech Igloo 2500 Pro, Thermaltake Volcano 7+ and GlacialTech Igloo 2500. Its noise degree us just 42 dBA (i.e. it works quieter than the old MicroFlow). In the long run, MicroFlow II has a firm position in the technical chart Top Ten falling behind the low-noise FalconRock II. 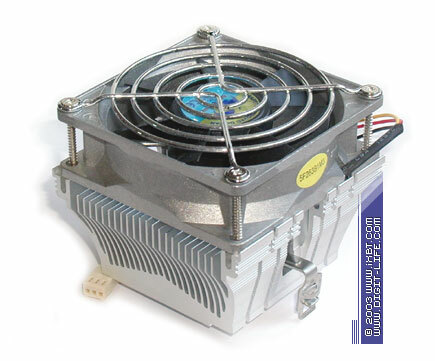 CopperBase carries an extrusion heatsink, 63x70x40 mm (base 50x70 mm), a fan, 60x60x15 mm, working at 4800 rom and a plain two-point mount. FridgeRock is actually a bigger copy of CopperBase with a thicker heatsink, 78x73x40 mm (55x67 mm base) and a higher fan, 70x70x25 mm with temperature control support. 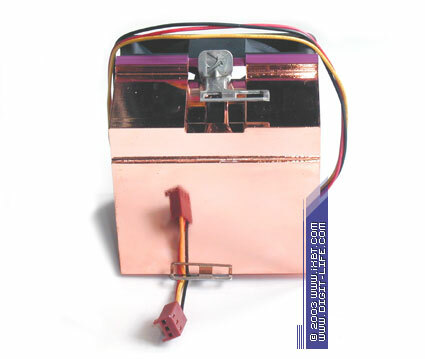 The coolers have a copper plate bolted to the heatsink base. Although soldering would be better, this plate still benefits the coolers (like in case of Cooler Master CP-6J11C and CP-6J31C). CopperBase and FridgeRock perform well: the former keeps up with BigRock and SuperRock being smaller and making less noise, while the latter is almost as good as FalconRock, though its noise level is much greater. In general, CopperBase and FridgeRock have good functionality, but they yield to modern and more solid counterparts. 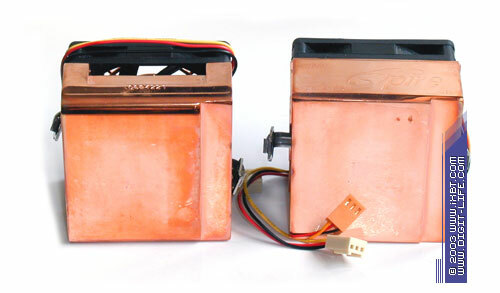 Two other Spire's coolers CopperKing and CopperKing II seem to be good and interesting solutions. 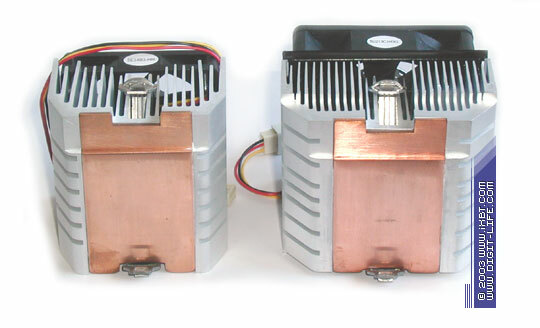 CopperKing has a compact copper heatsink, 65x60x28 mm based on the folded fin technology, a fan, 60x60x15 mm, working at the speed of 4500 rpm and a plain two-point normal mount. 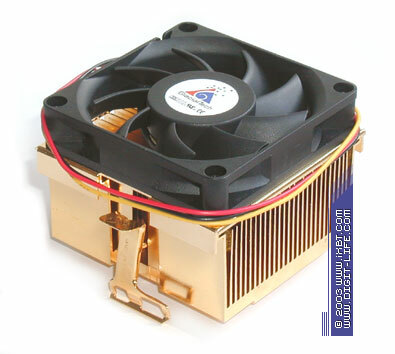 CopperKing II has simpler but identical heatsink (63x60x28 mm) and a speedier fan (5000 rpm). On the other hand, their performance is not that good - they work similar to budget BigRock and SuperRock. CopperKing II makes a lot of noise at that. Consequently, CopperKing and CopperKing II lose their attraction and go down the technical rating. These models could be useful in slim systems due to their dimensions, it they were not overpriced.